Our first attempt at making ice cream in a Ziploc bag was the night I discovered Thin Mints in the freezer. It was late. For some reason we decided we couldn’t have one without the other. The ice cream was a success. The night was memorable. Monday morning at the water cooler I shared my story and was surprised to learn how few of my coworkers had heard of this quick & easy process. So I’ve decided to join the ranks of many who have posted these 5 simple steps. Step #2 ~ Mix Ingredients (combine cream, sugar and vanilla in quart sized Ziploc bag, seal well and shake gently to combine. Slide quart bag inside gallon sized Ziploc bag then fill with ice and add 1/2 cup Kosher salt). Step #3 ~ Shake (I called Batman to help with step #3. The bag with ice/salt gets very cold, I suggest rolling it in a bath towel, then twisting the ends creating handles). Now click here and prepare to shake, shake, shake. Shake Your Booty. Do this for about 10 minutes. Step #4 ~ Check Consistency (if too soft, keep shaking. When desired consistency is achieved turn bag inside out and scrape ice cream into a freezer container. Keep frozen until ready to use). Step #5 ~ Enjoy! (now is when you can add mix-ins like crushed Thin Mints, or chocolate chips, or sliced strawberries to name a few. 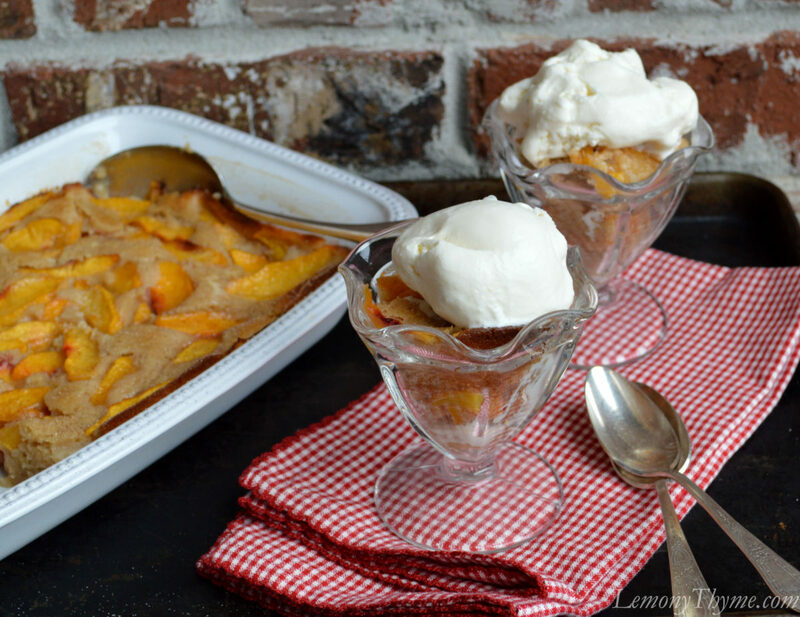 Or you can serve with warm Peach Buttermilk Cobbler which is how our second attempt came to be). Combine cream, sugar, and vanilla in quart sized Ziploc and seal well. Fill a gallon sized Ziploc with ice cubes, add the salt. Put the quart bag inside the gallon and seal well. Roll inside a towel and twist ends creating handles. Shake until the cream mixture thickens into ice cream, about 10 minutes. Remove quart sized bag and scrape out ice cream (turn inside out to get it all). You can then stir in your favorite additions, like Salted Chocolate Pretzel Toffee Bark pieces or Thin Mint Cookies if you happened to have some lying around.